I was recently invited to try some of the new meat range that myprotein.com have just launched. Myprotein are currently Europe's number one sports nutrition brand. They stock a wide range of fitness drinks, clothing, bars, snacks, even vitamins and minerals. To add to their range they have just launched their Fresh Meats range. The meat that they supply is beef however there are all types of beef that you could wish for from mince to sirloin steaks, from roasting joints to fillet steaks. The added benefit is that you know you are going to be receiving high quality, healthy meat. I placed my order on a Monday. On the Tuesday I received an email letting me know that my meat was ready for dispatch and I received it on the Wednesday. The delivery was super quick! The communication for Myprotein was fantastic, I was never left wondering what the status of my order was. Every change in status I was notified of it by email. When I received my package. It was reassuring to see that the meat had been packed the day before I received it. This is great as I know that the meat was freshly packed before sending. The meat was packed in a WoolCool® insulated lining which is made of 100% sheeps wool. This ensures that the contents remain at a constant temperature during transportation. All of Myprotein's meat is locally sourced from the finest British farmers to ensure that they are providing their customers with the finest quality grass fed beef. The beef is hung for 28 days which allows it to dry age. This leaves the meat a deep brown colour, adds flavour and tenderness to the beef. So far we have tried the steak mince and the minute steaks which have all been of a high quality and lean. 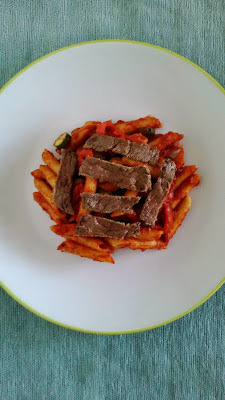 With the minute steak I created a delicious pasta dish Easy Ramiro Pepper Pasta with Minute Steak. Myprotein have got their meats priced at an extremely competitive rate and I would definitely recommend checking them out if you are looking to buy high quality, lean beef. Their delivery charge is only £1.99 on orders over £10 and then free is you spend over £50. In the future I will be buying from them again. I am currently planning some further recipes using Myprotein beef. I will be sharing one this week and another next week so keep an eye out for them! I have been delighted with the ease of using the Myprotein website. They provide the right level of communication with their customers with regards to their orders. The delivery was super quick, I was amazed by how quickly it arrived. The meat is of a high quality and you can tell by how it cooks and the taste. Basically, I cannot speak highly enough of Myprotein. My whole experience of their services has been exceptional. To see the full range of beef that Myprotein supply visit the Myprotein Meat Range. Disclosure: I was given a budget to spend on meat products from Myprotein. No cash payment was received. All views and opinions are my own and 100% honest.